Hull City chairman Paul Duffen has resigned from his position at the struggling Premier League club. There had been growing speculation about Duffen's future and that of manager Phil Brown. The Tigers were forced to deny on Wednesday that Brown had been sacked following a run of poor results. Former Hull chairman Adam Pearson has been linked with a return to the KC Stadium after he stood down as Derby chairman on Wednesday evening. 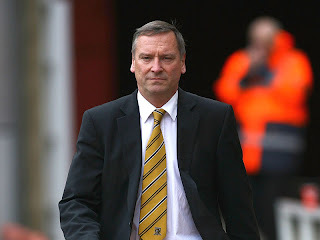 Duffen was part of a consortium that bought Hull off Pearson in June 2007, and the club were promoted to the Premier League the following season. Hull made an impressive start to the 2008/09 season but have struggled since the start of the year and, having just avoided relegation last term, lie 18th in the table. A statement from the Tigers said: "The club has received a letter of resignation from Paul Duffen, executive chairman of Hull City AFC and Superstadium Management Company Ltd, which has been accepted and is effective immediately. "The club wishes to express its gratitude to Paul for his outstanding contribution as chairman during a period of unprecedented success for Hull City AFC." Duffen made his own statement, which read: "When I succeeded Adam Pearson as chairman of Hull City Football Club in June 2007 I was very aware of the responsibility to build on his legacy. "I articulated an intention to take the Tigers to the previously uncharted waters of the Premier League and to the eternal credit of the players and coaching staff, that seemingly ridiculous ambition was achieved 11 months later thanks to a victorious debut appearance at Wembley in the play-off final. "The start to our maiden top-flight campaign broke all previous records for a newly promoted side and ensured that 2008 will forever be remembered as the most remarkable year in Hull City's history. "Football is a results business and in the same way that I enjoyed the successes of the previous two seasons, so I must take ultimate responsibility for the disappointments of 2009."